The Model 595 BiPod Polisher™ is a variation of the well known Tripod Polisher®. 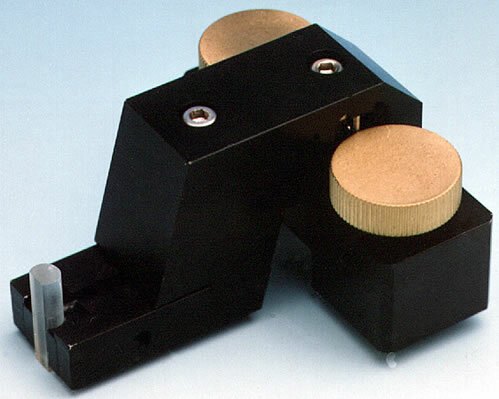 The BiPod Polisher™ is designed with flats on all sides which make it more suitable for viewing under a standard upright stereo microscope and also simplifies adapting the polisher for semiautomatic SEM cross sectioning. The BiPod Polisher™ is used in the same way as the Tripod Polisher® with the exception of it having only 2 feet and those feet being controlled by precision machined screws instead of micrometers. The BiPod Polisher™ can also be mounted easily onto either the Model 910 or Model 920 Lapping and Polishing machine with the appropriate yoke for semiautomatic polishing. The BiPod Polisher™ uses the same sample mounts as the Tripod Polisher® and the polishing procedure is essentially the same. 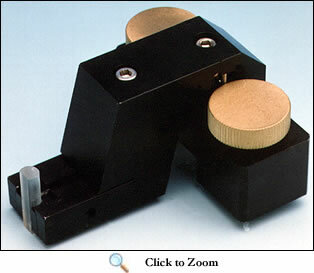 The BiPod Polisher™ is capable of being used for both SEM cross sectioning and TEM Wedge polishing. Description Part Number Price Enter Qty. L Bracket for BiPod™ Polisher 01-03768-01 99.00 Qty. Foot for BiPod Polisher™ 01-03145-01 19.00 Qty. Wedge Polishing Clamp 01-03077-01 53.00 Qty. Pyrex Wedge Polishing Rod 01-03076-02 24.00 Qty. SEM Stub 02-03063-01 65.00 Qty. Pyrex Wedge Polishing Stub 01-03076-01 17.00 Qty. Large Pyrex Insert 01-03065-01 20.00 Qty.